Do your friends tell you that you surf the Internet too much, or do you tell others that they spend too much time surfing the Internet? Or if you want to learn more about the concepts detailed in this article, consider taking an ATI course such as the following. The Navy has been procuring Virginia (SSN-774) class nuclear-powered attack submarines since FY1998. The two Virginia-class boats requested for procurement in FY2017 are to be the 25th and 26 th boats in the class. The 10 Virginia-class boats programmed for procurement in FY2014- FY2018 (two per year for five years) are being procured under a multiyear-procurement (MYP) contract. From FY2025 to FY2036, the number of SSNs is projected to experience a dip or valley, reaching a minimum of 41 boats (i.e., 25 boats, or about 38%, less than the 66-boat force-level goal) in FY2029. This projected valley is a consequence of having procured a relatively small number of SSNs during the 1990s, in the early years of the post-Cold War era. Some observers are concerned that this projected valley in SSN force levels could lead to a period of heightened operational strain for the SSN force, and perhaps a period of weakened conventional deterrence against potential adversaries. The Navy has been exploring options for mitigating the projected valley. Procuring additional Virginia-class boats in the near term is one of those options. In that connection, the Navy has expressed interest in procuring an additional Virginia-class boat in FY2021. Congress also has the option of funding the procurement of one or more additional Virginia-class boats in FY2018-FY2020. Applied Technology Institute (ATICourses) offers a variety of courses on Acoustic & Sonar Engineering. Raytheon reported that DARPA has received the prototype of a new underwater submarine detection system to be mounted on unmanned trimaran hulls. The Pentagon’s Defense Advanced Research Projects Agency (DARPA) has received the prototype of a new underwater submarine detection system to be mounted on unmanned trimaran hulls, Raytheon said in a news release. “Raytheon Company has completed delivery of its latest… fifth-generation hull-mounted sonar system, for… DARPA’s Anti-Submarine Warfare Continuous Trail Unmanned Vessel program,” the release, issued on Wednesday, stated. A prototype trimaran built by Leidos is designed to serve as the program’s unmanned vehicle, Raytheon explained. The Raytheon report followed published claims that Russia is apparently developing an underwater drone that will be able to inflict massive damage to coastal areas as part of a top secret project known as Ocean Multipurpose System: Status-6 carrying a torpedo equipped with a nuclear warhead. This weaponized drone will be capable of causing “assured unacceptable damage” to an enemy by contaminating vast coastal areas, rendering them completely unusable for long periods of time, and will be able to bypass NATO’s missile defense system. Applied Technology Institute (ATICourses) offers a variety of courses on Acoustic & Sonar Engineering as well as Radar, Defense, Missiles and Combat Systems. The new below would be of interest to our readers. China is building some “fairly amazing submarines” and now has more diesel- and nuclear-powered vessels than the United States. China is also expanding the geographic areas of operation for its submarines, and their length of deployment. For instance, China had carried out three deployments in the Indian Ocean, and had kept vessels out at sea for 95 days. The quality of China’s submarines is reportedly lower than those built by the United States, but the size of its undersea fleet had now surpassed that of the U.S. fleet. A spokeswoman said the U.S. Navy had 71 commissioned U.S. submarines. U.S. submarines are built by Huntington Ingalls Industries Inc. and General Dynamics Corp. Applied Technology Institute (ATICourses) offers a variety of courses on Acoustic, Noise & Sonar Engineering. The news below should be of interest to our readers. COTS stands for commercial off-the-shelf stands for commercial items and available in the commercial marketplace that can be bought and used under government contract. Motivations for using COTS components include hopes for reduction of overall system-development and costs (as components can be bought or licensed instead of being developed from scratch) and reduced long-term maintenance costs. Now COTS computer equipment for sonar signal processing designed by General Dynamics Corp. will be introduced to to US Navy submarines. The MPP is a multi-array interface receiver that provides signal conditioning for received array signals; data processing; digital formatting of data; beam formation; and signal processing for A-RCI display data. The TSMS, meanwhile, monitors and localizes the submarine’s own noise sources including transients, so onboard sonar systems can compensate for it and improve its ability to detect and identify sound emissions from other submarines ad surface ships. The TSMS feeds its data to the MPP. A 20-year-old “genius” electronic engineer and his father are among the crew searching for the missing Malaysian flight MH370. Applied Technology Institute (ATIcourses) offers a variety of courses on Acoustic, Noise & Sonar Engineering. The news below will be of interest to our readers. When Jay Larsen, the chief engineer on MH370 search vessel GO Phoenix, needed a new technician, his 20-year-old son Kolter sprang to mind. “He’s an electrical engineer genius and we asked him to come along,” he said. “He’s been a very solid member. I’m proud of him. “I don’t know that we can understand the weight of what we’re doing honestly. Jay and Kolter are key members of a search crew on board the GO Phoenix, a vessel scouring the Indian Ocean for the missing Malaysian Airlines Flight 370 (MH370), which disappeared March 8 while ferrying 239 passengers and crewmembers from Kuala Lumpur, Malaysia, to Beijing, China. And while the Flathead Valley natives long to be home tracking elk sign through the wet November snow, the significance of their contribution to the search expedition isn’t lost on either of them. For seven months, family members of the missing passengers and flight crew have been waiting for answers buried in a watery abyss, and Larsen hopes his highly specialized sonar technology can help bring them to light. Jay Larsen owns the Whitefish-based deep-sea survey company Hydrospheric Solutions LLC (HSI), and, as chief engineer of the sonar kit that the ship is towing miles beneath the ocean surface, he has spent the last month mapping the undulating mountains and crevasses of the ocean floor, working round-the-clock to locate the missing flight in the remote southern Indian Ocean. His son, Kolter, an engineering student at Montana State University – Jay’s alma mater – joined the crew somewhat serendipitously as an electrical technician while taking a semester off college. The sonar that HSI is towing 3.2 miles beneath the ship is called the SLH ProSAS-60, owned by SL Hydrospheric LLC, a company that Larsen still co-manages and co-founded in 2008 with the purpose of bringing the rarefied device to the deep-sea surveying market. Applied Technology Institute (ATI Courses) offers a variety of courses on Radar, Missiles & Combat Systems and Acoustic, Noise & Sonar Engineering. The news about new NAVY’s stealth destroyer would be of great interest to our readers. The US Navy’s newest and biggest toy is the imposing Zumwalt-class guided-missile destroyer, a svelte, stealthy entry designed to complement the Navy’s large fleet of Arleigh Burke-class DDGs. Considering everything from its stealthy figure – which allows it to appear on radar as the same size as a fishing boat – to its 155-millimeter (six-inch) Advanced Gun System represents a significant leap forward in naval technology, it’d be impossible for us to recap all the significant features on this new ship. 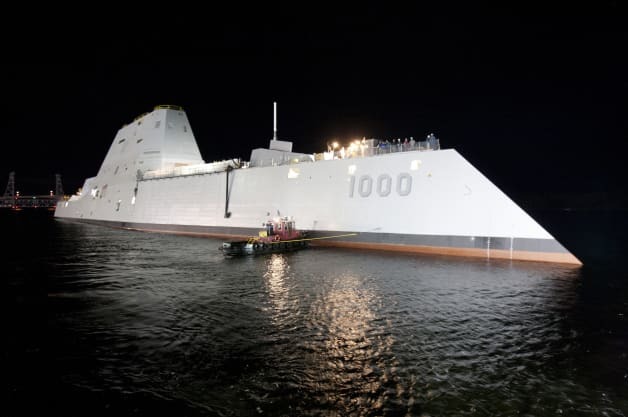 Thankfully, Defense News has a really thorough and feature-laden story on the lead ship of the class, theUSS Zumwalt. Covering the ship from bow to stern, anything you might want to know (and that’s been released to the public) about this new destroyer can be found there. Head over and have a look!